On Saturday night Derby promoter Dan Gray presented his latest offering, the rather aptly named ‘Back to Business’, I say that because Gray narrowly averted disaster and secured a new venue, Queens Hall in Derby, for the sold out event just days before, following an incident that had nothing to do with Gray or the promotion led to licensing of boxing at the original venue being suspended. Whilst this was a fifteen AmPro fight card and there were definitely some very noteworthy fights and performances on the Amateur side of the card, this report focuses only on the Professional element of the card, especially the phenomenal headlining Paul Peers versus Gregorijs Dunecs World Boxing League (WBL) and European Boxing League (EBL) European Championship fight, but more on that later. 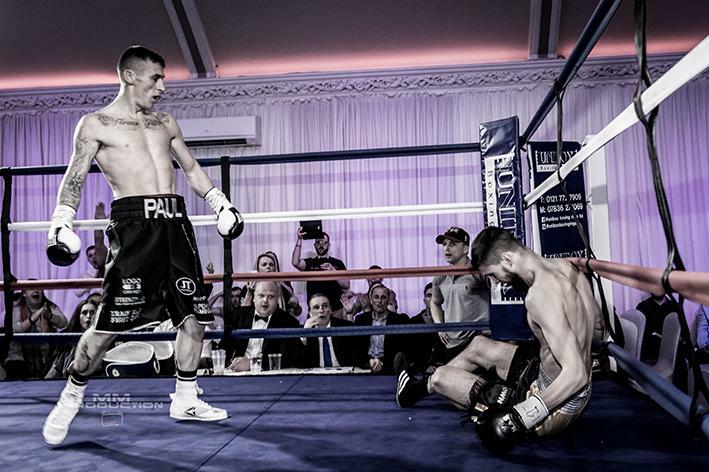 The opening professional fight of the night see Nathan Russo make his most welcome return to the ring, after a near three year sabbatical from the sport, in action against Dundalk, Ireland’s Michael Kelly. 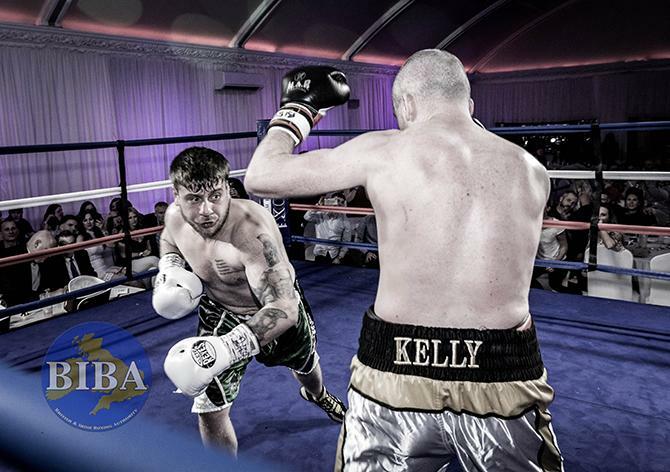 Right from the off Russo meaningfully strode to centre ring and greeted Kelly with a big right, Kelly absorbed the blow and responded with a good stiff jab. Initially the combatants entertained the fans ringside with some flowing exchanges and then about a minute or so in Russo changed tact and began peppering Kelly’s body with some massive hooks, forcing the Irishman to go on the defensive and rely on good stiff jabs and the occasional slick combination. As the round progressed Russo stepped up the pace and power, albeit still focusing on the Irishman’s torso, which had the desired effect and forced Kelly to take to a knee with about thirty seconds of the round remaining. 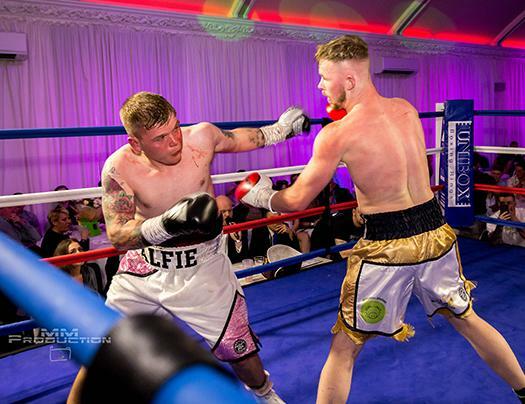 Russo once again strode to centre ring and once again let rip with a vicious body shot, Kelly though was ready and prevented the Exocet hitting its target, this time Kelly responded with a double handed flurry. 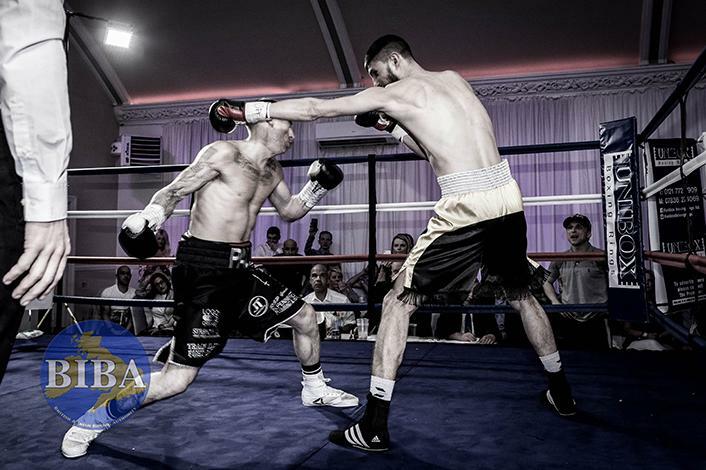 Russo stood his ground, letting rip with a slick combination in return before once again targeting the Irishman’s body with stinging hooks. As with the first round, as the fight went into the final minutes Russo began to put serious weight behind the body shots and once again sent Kelly to the canvas following a mega powerful left hook to the lower rib. Kelly is as tough as they come and rose to his feet just as the count reached eight, which clearly surprised Russo’s fans who were so convinced their man had secured another stoppage win they began vitriolic chants almost immediately the irishman went down. With around thirty seconds of the round round remaining Russo went straight on the attack once more and again sent Kelly to the canvas with a wicked left hook that caught the Irishman just around the kidney area. Once more Russo’s fans began their disrespectful chanting at the anticipated victory for their hero, however as if to put a finger up to Russo’s huge contingent of fans for their chants, Kelly rose to his feet in time to beat the count and see out the round. Just as the ‘Corners Ten Second’ call was about to be made, Kelly’s coach signalled to Referee Rob Jones that Kelly was not able to continue, unfortunately that was encouragement enough for the disrespectful fans to step up their chanting once more. Before I move onto the next fight I would like to address the increasing lack of respect afforded to opponents by some so called fans. On Saturday night I was utterly disgusted by the unbelievably disrespectful chants from a small contingent of Russo’s fans towards Kelly. There has been a bit too much of this lately, just last week I was also disgusted at one of the worse cases of racist abuse suffered by a fighter on the ring walk, and beyond, I’ve heard at a UK event in a long, long time, in that particular case the victim being Kash Ali. The disgusting behaviour of the fans that night revived memories from back in 2008 when Thomas Adamek’s fans rained abuse, and much more, down on Steve ‘USS’ Cunningham and his entourage, which included myself and my fiancée, Team ‘USS’ Cunningham signed Bantamweight Marianne Marston, during the ring walk at the Prudential Centre in Newark, New Jersey. In my view there is no place in our wonderful sport for this kind of abuse and I seriously hope that boxing isn’t going to become like football, where it had become so bad that the authorities that control the sport had no option but to introduce legislation in an effort to stop abuse being reigned down on the players. OK, enough of my preaching, let’s get onto the next fight, which pitted Jack Jones against Dean Porter. What a cracking closely fought contest this was, it was a real pleasure to watch as the two protagonists entertained the appreciative crowd with their finely honed ringcraft. Whilst they may have very contrasting styles, Porter’s being very much an aggressive full on attack oriented and Jones’ more stylised, controlled, yet forceful approach, surprisingly this clash of styles made for a particularly enjoyable fight to watch. Porter made his intentions clear right from the opening bell, it was attack, attack and just to be sure attack once more, however Jones remained calm and collected and whilst he had no option but to absorb some big power shots, his calm demeanour enabled him to pick his punches, both on the attack as well as when defensively countering, with pin point accuracy. After four fantastic, close fought rounds of boxing it was to Referee Rob Jones’ scorecard, which read 39-37 in favour of Jack Jones. Have to add that whilst without doubt the correct result its still doesn’t reflect just how close each and every round was. Now to the main event of the night, Orkney based Liverpudlian Paul Peers versus Latvia’s Grigorijs Dunecs for the vacant World Boxing League (WBL) and European Boxing League (EBL) European Championships. 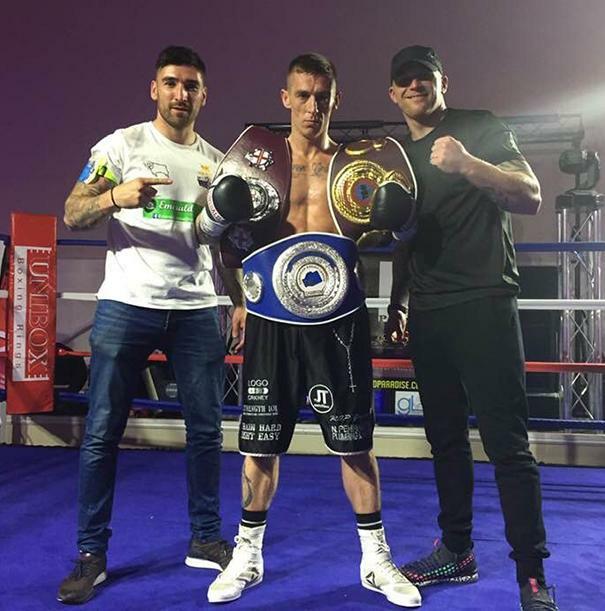 Now I’ve seen both Dunecs, when he fought Ross Doherty last year, and on numerous occasions had watched Peers in action previously, so believed I had a pretty good idea how the fight would pan out, however I have to put my hand up and admit I couldn’t have been more wrong if I tried. Right from the ring walk I noticed something very different about Peers, besides him appearing so focused and confident, his physique was seriously toned, don’t get me wrong he always has looked toned but on Saturday night he was seriously ripped and looked much bigger, muscle wise. I’d also like to add at this point that the fans in attendance, including Peers’ supporters, were respectful and showed their appreciation when Dunecs made his entrance, which was in sharp contrast to the reception Kelly received earlier in the evening. OK, let’s get to the fight itself, well right from the opening bell Peers strode purposefully towards his opponent, initially a small exchange ensued and then suddenly Peers stepped up a gear, dipped and swayed his way into range and let rip with a huge right, left combination. Dunecs looked to counter but Peers’ movement put paid to that and left an opening for Peers to manoeuvre in and fire off another salvo, which became a theme of the first minute or so of the contest, well at least up to the point when Peers sensationally worked a full on attack to the body with the right hand and immediately throwing a sensationally accurate left hook to the head that sent Dunecs crashing down to the canvas. Dunecs made the count, just, and on the restart Peers went on the attack again, catching Dunecs with a shot that sent the Latvian almost down again, however Dunecs still had no option but to take a second count as his glove touched the canvas during his attempt to prevent being on the deck a second time. On the restart Peers went in hard and fast, Dudecs tried in vein to keep the marauding Liverpudlian at bay, but to no avail, as Peers let rip with another right-left to the head that sent the Latvian down again, this time on his rising Referee Robert Jones made it clear he had seen enough and waved the fight off. Official time of the stoppage 2 Minutes and 47 seconds of the first round. Don’t get me wrong it wasn’t all one way traffic Dunecs put up a fight but Peers’ movement meant air shots rather than meaningful shots, in fact one such attempted assault see Peers weaved and limbo Matrix style under a massive shot before countering with another pin point accurate shot. Have to admit that I cannot possibly have got across just how sensationally spectacular Peers’ performance was and suggest it’s well worth searching out the video, even if just to watch the sensational first knockdown.